As much an exercise in wordplay and narrative structure as it is a rendition of Freshman year woes, Lubar's (Dunk) story starring Scott Hudson, a brain from a blue-collar background, contains many stock characters and situations associated with high-school initiation. In his first few weeks at Zenger High, Scott gets smacked by Seniors, robbed of his lunch money, ignored by the girl of his dreams and ousted out of his position of youngest member of his family when his mother breaks the news she is pregnant. On the bright side, he has a great Honors English teacher, who encourages Scott to join the newspaper staff and introduces him to some interesting literary devices that Scott practices throughout the novel. Speaking in ""Tom Swifties"" ("" 'I lost my wrists,' Tom said offhandedly"") couplets (""Me dance?/ Fat chance"") and a few different points of view, Scott reports sports news for the school newspaper and, in a series of journal entries, lends advice to his unborn baby brother. 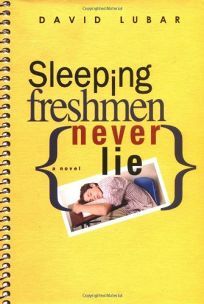 While the book does offer some humorous moments and real-life drama (such as when an unpopular classmate attempts suicide), it strains too hard to be clever. Most readers will breathe a sigh of relief when the gimmicks start to fade as Scott tries his hand at conventional journalism. Ages 12-up.